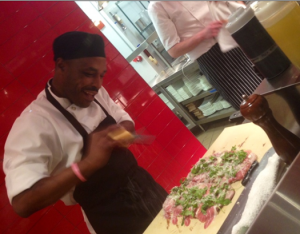 Mark your calendars now for one of DC’s best dining events. 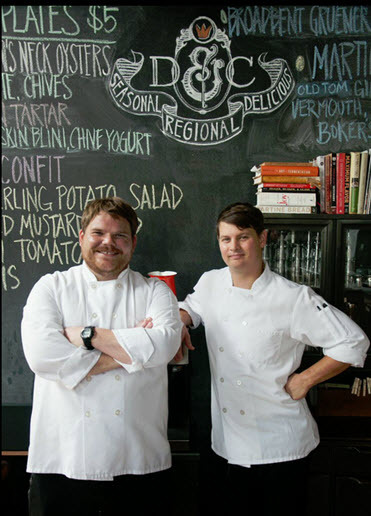 On December 16th the 2014 StarChefs Washington DC area Rising Stars Gala will be at Dock 5 at Union Market. There’s even a special VIP reception where swells can sip champagne and nibble on Petrossian caviar before the awards ceremony and tasting gala dinner. The celebration will feature local foods, chefs, bartenders, roasters, brewers, artisans and sommeliers. The fundraiser for DC Central Kitchen will be hosted by Bryan Voltaggio former Top Chef and Top Chef Master finalist and Chef/Owner of Volt, Range, Lunchbox, Family Meal and Aggio. Co-Hosts are Jason Alley of Comfort, Bertrand Chemel of 2941, Nadine Brown of Charlie Parker Steak, Chris Ford of Range, Stefan Trummer of Trummer’s on Main, Nick Stefanelli of Bibiano and Katsuya Fukushima of Daikaya. The winning chefs will prepare all the food on this fabulous night and I will be there. Will you? 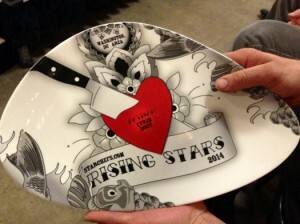 For tickets and information visit www.starchefs.com/risingstars. Phillip Perrow and Caleb Shriver of Dutch & Co.
One of the best ways I know of to get excited about the Christmas season is to get thyself (and thy family) to the theatre where you can watch dancers soar in Septime Webre’s The Nutcracker performed by The Washington Ballet, sing your heart out to the National Symphony Orchestra’s performance of Handel’s Messiah at the Kennedy Center, or be transported by the age-old charms of A Christmas Carol. Whether you’re a traditionalist or modernist, there’s something for every taste, and plenty of holiday spirit for the kids too and plus a whole lot of ICE! to pretend we’re at the North Pole. 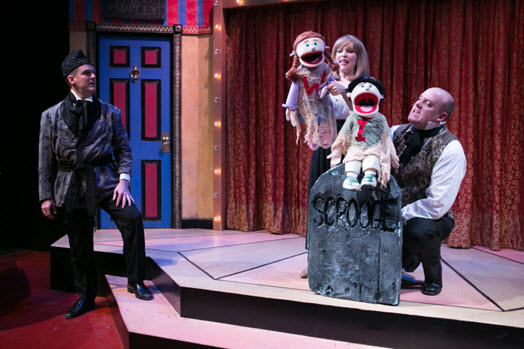 At Signature Theatre it’s zany adult fare with a new spin on the beloved seasonal revue, Holiday Follies. Directed by Walter Ware III with musical direction by the inimitable Howard Breitbart, it’s an audience song choice evening featuring four fabulous singers, Gannon O’Brien, Stephen Gregory Smith, Delores King Williams and Bayla Whitten in a cabaret set list that changes with each performance. For tickets and information visit www.Signature-Theatre.org or call the box office at 703 820-9771. North Pole enthusiasts will enjoy thrills and chills at this year’s ICE! – now at the Gaylord National Resort. The fun starts at the door of this glamorous resort when you lay eyes on the 60-foot tall glass tree glowing with over 2 million lights and gaze at the nightly indoor snowfall and musical “dancing” fountains. There’s fun for the whole family at the “Christmas on the Potomac” celebration where Frosty the Snowman is the star attraction. For info visit www.ChristmasOnThePotomac.com. Carved from more than 2 million pounds of brightly colored ice sculptures and kept at a crisp nine degrees, you’ll stroll through life-size scenes of Frosty coming to life, marching through the Town Square, taking a train to the North Pole and Santa coming to the rescue to make “melted Frosty” whole again. 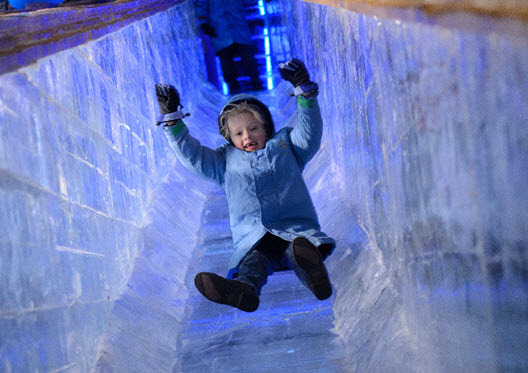 Kids and grownups will want a turn on the two-story ice slide before checking out the interactive “Frostbite Factory”, where the Chinese artisans show off their master ice carving skills. Afterwards head to the Atrium where little ones can hop aboard the miniature Peeps & Company Potomac Express Train or join DreamWorks’ Gingy from Shrek to decorate a gingerbread house to take home. 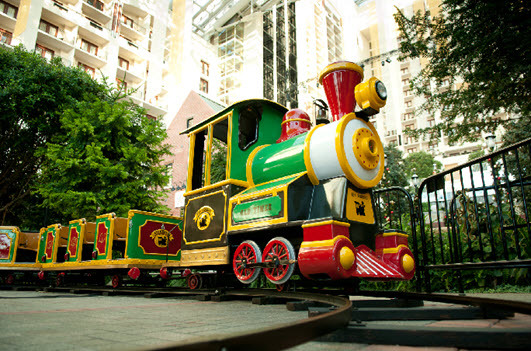 Along the way play The Great Reindeer Roundup scavenger hunt throughout the hotel’s indoor gardens. 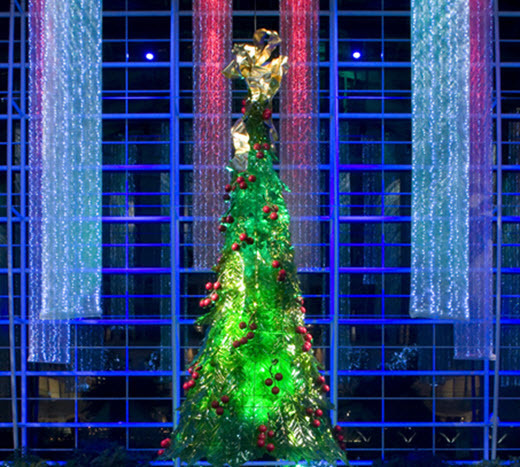 To learn about the many other holiday plans at the resort and to make reservations for the Brunch with Santa at Old Hickory Steakhouse, a DreamWorks’ Madagascar Crack’ A Lackin’ Cook-in Character Breakfast or buffet Dinner, a Yule log pastry making class, or a wine and cheese pairing class with the Old Hickory’s Maitre d’Fromage visit www.GaylordNationalTickets.com or call 301 965-4000. 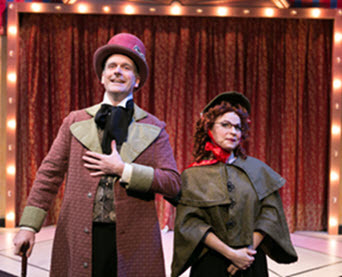 At MetroStage the Great White Way is celebrated in A Broadway Christmas Carol, a spoof of the classic tale featuring the usual suspects – – Marley, Scrooge, Mrs. Fezziwig, The Cratchits and Tiny Tim. Set to familiar Broadway blockbusters this madcap Christmas special is performed by three phenomenal singer actors, Peter Boyer, Michael Sharp and Tracey Stephens plus alternating pianists, Howard Breitbart and William Knowles. 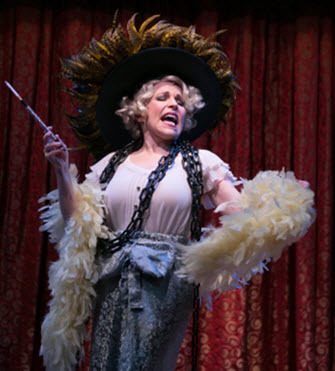 Lyricist Kathy Feininger has concocted all the belly laughs you can handle in this riotous revue that draws its musical chops from all your fave shows like Oklahoma, Guys and Dolls, Les Miserables, Phantom of the Opera, The Wiz and many, many more. More than five-dozen tunes and a whirlwind of wacky costume changes jam-pack this hilarious parody directed and choreographed by Michael Sharp. For tickets and information visit www.MetroStage.org or call the box office at 703 548-9044. 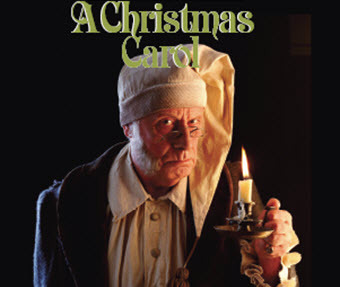 For the traditionalist The Little Theatre of Alexandria presents its annual heartwarming classic, A Christmas Carol, Charles Dickens’ classic tale of transformation and redemption. Set against the backdrop of Victorian England, the show has gorgeous costumes, ghastly ghosts and charming children. Rachael Hubbard adapts and directs this picture perfect Christmas postcard for a family friendly show that reminds us all of the true meaning of the season. If it’s a Currier & Ives Christmas you hunger for, this is the show for you. 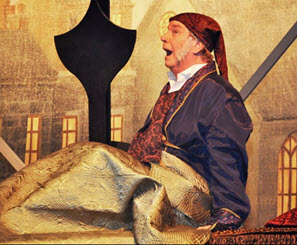 For tickets and information visit www.TheLittleTheatre.com or call the box office at 703 683-5778. Elisabeth de Kergolay has led a charmed life with nannies, chateaus and pied-a-terres, though that’s never stopped the beautiful young countess from using her entrepreneurial spirit to bring fresh ideas to America. Take for example her early investment in Le Pain Quotidien, the rustic chic French bakery café she invested in with Belgian chef and founder Alain Coumont in 1990. Since then the well-known communal table eatery with four locations in the DC area, has skyrocketed to 200 outlets in 17 countries. She clearly knows a great idea when she sees it. 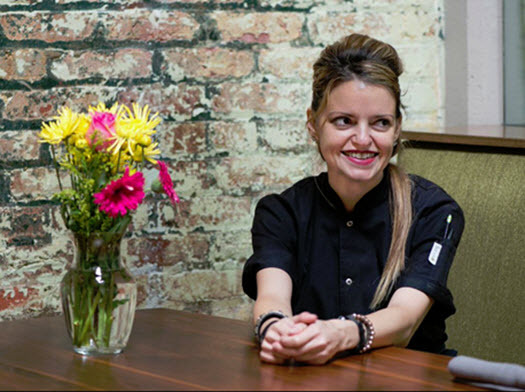 Recently de Kergolay launched a frozen food emporium in New York City that is poised to recreate the same success she has enjoyed through her earlier business foray. 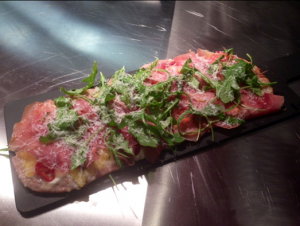 Fashioned after the popular Paris store Picard, Babeth’s Feast opened on the Upper East Side in early August. The groundbreaking store offers high-end frozen foods and cooking demonstrations. Where has this clever idea been? After learning about her venture at the opening of Daniel Boulud’s new DC outpost DBGB, Whisk and Quill was highly intrigued to learn more about this novel concept. Jordan Wright – What is your past experience with food? Elisabeth de Kergolay – I grew up around food, and being around Daniel when I was young was a great experience. Tell me about your inspiration for Babeth’s Feast? How long has it been in the planning stages? It was based on the concept of Picard from France. Arriving in New York in 2008, I like many other French people wondered, ‘Where’s the frozen food store? Where’s the Picard?’ When I realized there wasn’t one, I thought it had been tried and failed. But actually it had never been tried! So I thought about it a lot and spoke to quite a few people and decided to go ahead. I knew there was a niche for this, though it took several years to achieve. We had to do absolutely everything from the ground up – – creating and positioning the brand, selecting the products and designing the packaging. The idea was to have a full range of products. We like to think of ourselves as a frozen grocery store where you can get anything you want for every meal of day. We have 400 products divided up into 10 different food categories. 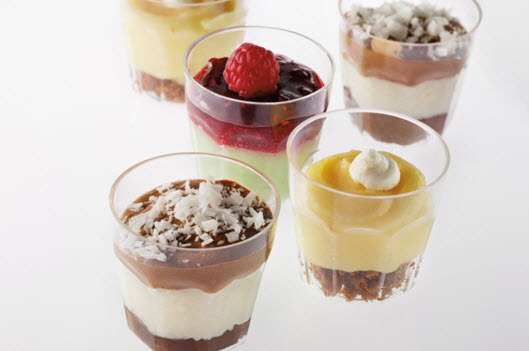 For sourcing and creating the recipes we have our chef, Susie Cover, who develops the recipes. Initially we made a list of what we liked of French-inspired foods then adapted them slightly to suit American tastes. We make over half of our products. Some are made by Susie, and some by private label, others are manufacturers’ brands made by companies who are specialists in their field. Of course we want our own products to be predominant in the future, but for the moment the remaining products are manufacturers’ brands. For that we select small companies who are specialists in their field. Has Daniel been involved with Babeth’s Feast? Daniel wrote a recipe for our cabbage soup using our fantastic lobster tails – – something new we had brought in for the holidays. We work with a lobster manufacturer in Maine to assure the most impeccable quality. In the future I want to explore having other chefs create dishes for us. Are all the foods prepared? 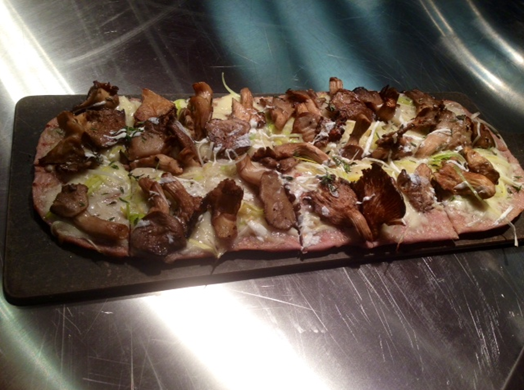 Mostly, but some are unprepared cuts of meat and sausage and things that we source locally from the Hudson Valley. Also all our fish are raised sustainably. 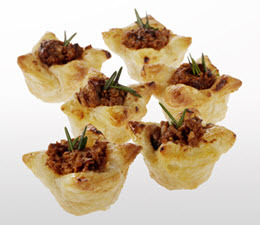 For uncooked products we help the customer with recipes. Susie does. We brainstorm together to come up with different dishes and then she comes up with a recipe. Most of the original ones we did were traditional French, but we have moved on to curries and other things. We taste new dishes with our store team and our board to decide which we like. 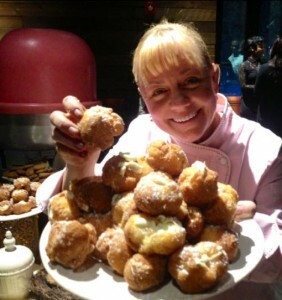 For the best local products, Susie also visits the food shows. For example, our ice creams are from Maine and New York, our meat-based products are prepared in Connecticut, and we produce our soups and quiches in New York. Are they made in the sous vide style? Ours are flash frozen, but some of the products we carry are made sous vide. How are they readied for the table by the consumer? Usually we have three options – bake, microwave or pan-warmed as with our velouté soups. Of course if it’s a gratin, it needs to be baked. Do you sell any fruits, herbs, lemons or salad fixings to complement the dishes? We have a selection of frozen herbs that have been very successful from the day we opened, like chopped onion, garlic and shallot, as well as sauces and spreads. And we have a pantry category as well. 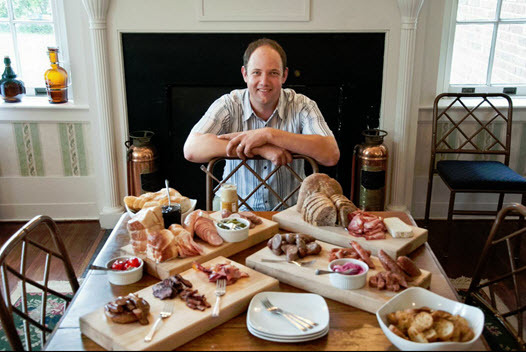 We carry crackers for the spreads, jams for our breads and sauces for our meats. Some of the jams are ours and some are French brands that are not yet known in the US. Do you find customers buy your products to take to their weekend homes for entertaining? Absolutely. I think the customer has yet to get used to the idea of having things in advance for special occasions as well as for regular use for whenever you need them. For me, although I still like cooking, perhaps I won’t make a side dish. I might make some fish or meat that I’ve purchased elsewhere to complement some of the side dishes that I keep in my freezer. It’s a whole way of mastering the use of frozen food. It answers many needs. Do you ship to customers who might not have access to high quality foods? We ship nationwide by FedEx. It’s packed in dry ice. And we deliver around Manhattan too. So far mostly the main courses like Coq au Vin, Veal Blanquette, Chicken Provençal and Chicken Tarragon. 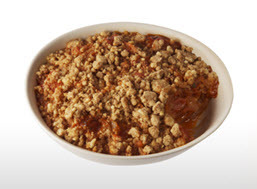 Also side dishes like Susie’s gratins and her favorite savory crumbles. She’s made three this season – one with Brussels Sprouts, one using tomatoes and another with butternut squash. What surprised you the most since you’ve opened? I think really the time and the interest that people spend in the store looking before buying. When I shopped at Picard in France I was single and going out all the time, I didn’t spend a lot of time looking. People are learning that we have a tasting area where we sample all day long. It was something that was indispensable to the success of the store. Because when they try they “get it”, and it’s so satisfactory for us. We know there’s a certain stigma attached to frozen food because the offerings haven’t been great. In France people choose to go to the frozen food store. It’s not considered a last resort. I looked at your online calendar and your upcoming cooking demonstrations sounded exciting. I was especially captivated by the one called “Comfort Food” featuring Cauliflower Blue Cheese Velouté, Lamb Shanks, Sweet Potato Écrassé, and the Banana Apple Crumble. Are you also teaching your clients to cook at home as well as purchasing the products? We show them how to pull it all together. When we give a demonstration we’ll use a few different products to create a meal. We want to keep it simple. We also show people how to plate the foods and show them tricks as how to serve it in their own dishes. What other helpful tricks do you use? We use a color code for each category of product. The idea behind this was to see exactly what the product is when it’s in the freezer. Like the breakfast products are coded yellow. That way you can see immediately what you have without having to rummage around. 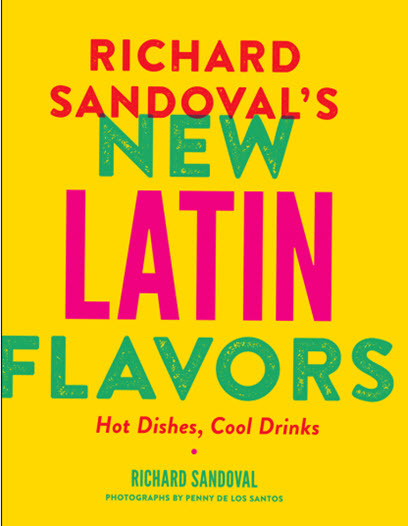 World-renowned chef and international restaurateur Richard Sandoval has penned his latest cookbook, New Latin Flavors – Hot Dishes, Cool Drinks (Stewart, Tabori & Chang) just in time to spice up the holiday season. 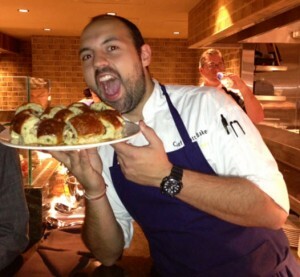 Most of you will be familiar with his DC Latin/Asian fusion restaurants Zengo, Masa 14, El Centro D. F., but also Ambar with its flavor-forward Balkan dishes, La Sandia in Tyson’s Corner, or the chic, sleek Toro Toro, a churrascaria that opened downtown this April. 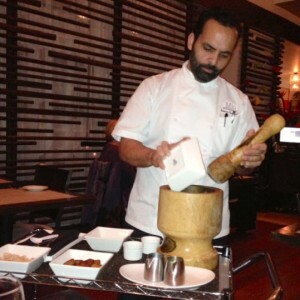 With thirty-eight successful restaurants worldwide from Dubai to Paris and New York to Mexico, Sandoval’s empire is a testimonial to his delicious contemporary Latin cooking. In his fifth cookbook Sandoval has given us a collection of 125 inspired recipes that draw from the rich culinary traditions of Mexico, Peru, Venezuela and Argentina. Gorgeous photographs from Saveur photographer Penny De Los Santos grace the pages and highlight the mouth-watering recipes. 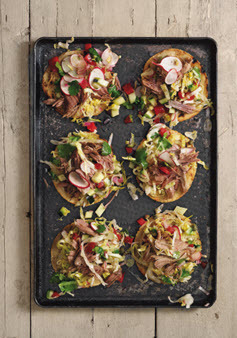 For the first time Sandoval has tailored a cookbook expressly for the home cook spanning his repertoire of quesadillas, ceviches, arepas and enchiladas plus delicious Latin-inspired cocktails. Think tequila, mescal, cachaça, rum and pisco. Do you feel a party coming on? 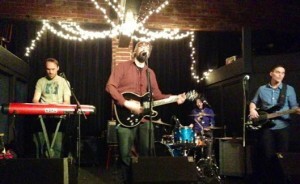 Whisk and Quill caught up with Sandoval after he had dodged a blizzard in Denver to get to his DC book launch. Whisk and Quill – What direction do you think food is going in today? 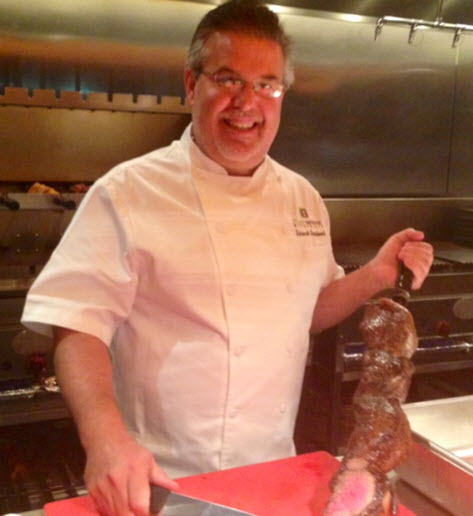 Sandoval – I think after the recession people’s ways of eating have changed dramatically. The last ten years it went very forward with all these molecular restaurants. I wanted to go retro. You know, back to our roots, back to comfort food and local ingredients, to make people feel comfortable again. 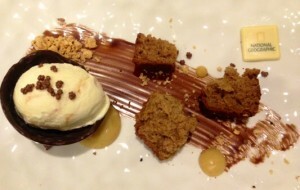 Would you agree that some of the best dishes from the past have been ruined by modernization? Although now I see more chefs returning to the classics but putting their own spin on it. Absolutely! That’s always been my approach. A lot of my Latin cooking started with my grandmother in her kitchen. 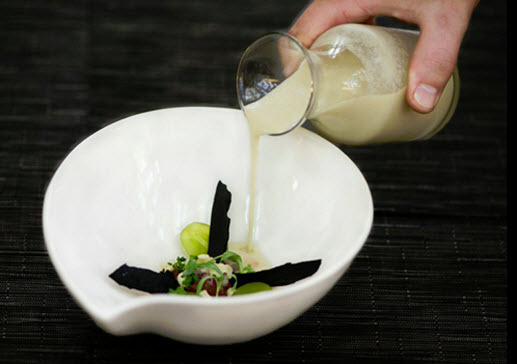 I would take dishes, like the mole, and interpret them in my way. I took the roots of these recipes and kept them the way they were meant to be. I’ve always loved chiles and you’ll always see chiles in my cooking. But as far as cuisines, in the past three or four years I’ve been doing more Peruvian. I love it. And I love Thai food. I’ll be opening a restaurant in mid-January at the new City Center here in DC. It’s called Mango Tree. We brought a chef from Bangkok who worked at one of the other Mango Tree restaurants. I plan to take the roots of their cuisine, tweaking it a little bit as far as my flavor profile and presentation, but leaving the core as it is, maybe just changing the heat level and the balance. I’m incredibly excited. 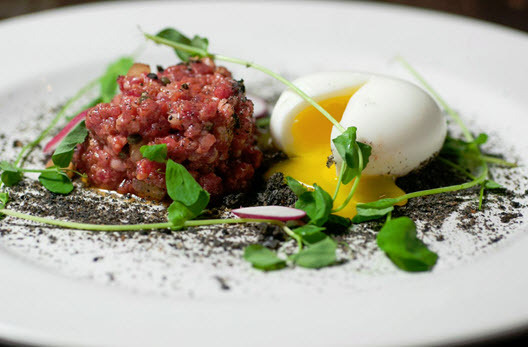 The restaurant already exists in London and Bangkok and Dubai. It’s classic Thai. I’ll just be readjusting it to what I do. How do you begin to create a fusion dish? Do you start with a single ingredient or do you use your palate’s imagination? I start with a single dish. The first fusion restaurant I did was Zengo, and Zengo means ‘give and take, back and forth’ in Japanese. It was two chefs, two cultures. First I would do a Latin dish. I hired an Asian chef to work with me and I would give it to him and he would ‘Asianize’ it. Then he would create an Asian dish and give it to me and I would ‘Latinize’ it. It’s two chefs collaborating. It wasn’t just me reinventing Asian, or what I thought it was. This way it made more sense to me. When had my first Mexican restaurant twenty years ago, it was doing modern Mexican cuisine – – with more forward thinking. In this book I went retro with more traditional food and more comfort food. It’s very accessible to the home cook. It was very important to me to make sure that when people buy this book, they see it’s about having fun, that it’s not overly complicated where people would look at a recipe and say, ‘Ohmygod, I’ve got to go to Williams Sonoma to get the equipment and will I be able to find the ingredients?’ I wanted to be sure I made it very accessible and very fun. Who would you most like to dine with living or dead? I’ve always been very intrigued by Nelson Mandela. How someone can spend so much time in jail and then be able to come out and forgive. Most people would not be able to let go of what happened to them. He just kept moving on with his life and changed his country with his strong spirit and by sharing his ideas. What if I asked you to name a woman? Wow! I’ve always liked Shakira! She’s a beautiful woman and a great artist and I love her music. Maybe she could sing to you. I don’t think her husband would appreciate that! Okay, I could cook for her and she could sing to me. Here are a few recipes to spice up any holiday party. 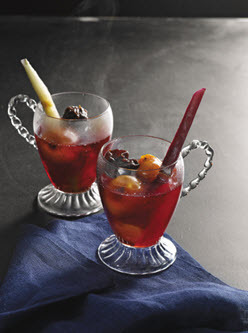 The Mexican warm fruit punch of the holiday season, ponche is sometimes nothing more than spiced syrup with booze. My family recipe is better, and infused with the tropical flavors of hibiscus and tamarind. Bring 2. quarts (2.5 L) water to a boil in a large nonreactive saucepan over high heat. Remove it from the heat and add the hibiscus flowers and cinnamon stick. Let them stand for 5 minutes. Add the sugar and tamarind and bring them to a simmer over high heat. 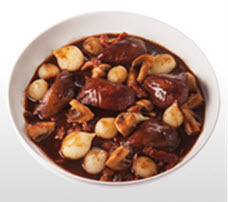 Reduce the heat to medium-low and simmer, stirring often to break up the tamarind, for 5 minutes. Strain the liquid into a large heatproof bowl, pressing hard on the solids; discard the solids. Return the liquid to the pot. Add the sugarcane, if using, and bring the liquid to a boil over high heat, stirring to dissolve the sugar. Reduce the heat to medium and cook the liquid at a brisk simmer for 5 minutes. Strain it again to remove any tamarind debris. 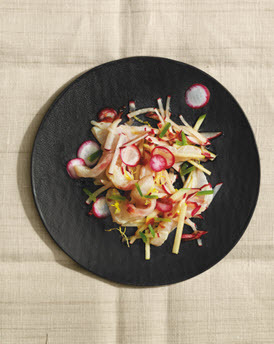 Tiradito is the South American version of ceviche, and it often has Asian influences, such as the ponzu in this recipe. It is one of the lightest (and quickest) first courses you’ll ever make, yet at the same time, it is one of the most flavorful. There are many good brands for sale, but it is also easy to make your own (page 48), and it is worth the minimal effort for this recipe, where it plays such a big role. Just before serving, use a V-slicer or mandoline to cut the apple and radishes into julienne. (You can also use a chef’s knife.) Combine them in a small bowl. Make the dressing: Whisk the vinegar, lime juice, onion, oregano, salt, and pepper together in a medium bowl. Gradually whisk in the oil. Grill the tortillas: Prepare an outdoor grill for direct cooking over medium-high heat. For a charcoal grill, let the coals burn until they are covered with white ash and you can hold your hand about 1 inch (2.5 cm) above the cooking grate for about 3 seconds. For a gas grill, preheat it on high, then adjust the heat to 450oF (230oC). Or preheat a stovetop grill pan over medium-high heat. Lightly brush the tortillas on both sides with oil. Place them on the grill and cook, with the lid closed as much as possible, turning them occasionally, until they are crisp and lightly charred, about 2 minutes. Remove them from the grill. Toss the lettuce, cucumber, tomatoes, radishes, capers, and cilantro with the dressing in a large bowl. Place a tortilla on each of six dinner plates. Divide the lettuce mixture among them, topped by the beef. Top them with the sliced avocado and serve immediately. Slowly simmered with tomatoes and jalapenos, this braised brisket is called ropa vieja (“old clothes”) because the shredded meat looks like raggedy clothes. There will be about a cup or so of the cooking liquid left over—be sure to save it as a sauce for pasta or polenta. You may even want to serve this as a main course with Mashed Potatoes with Oaxaca Cheese (page 145). Position a rack in the bottom third of the oven and preheat it to 350oF (175oC). Heat the oil in a Dutch oven over medium-high heat. Season the brisket all over with 1 teaspoon salt and . teaspoon pepper. Place it in the Dutch oven, fat-side down, and cook it, turning after 5 minutes, until it is nicely browned, 10 to 12 minutes. Transfer the brisket to a plate. If needed, add another 1 tablespoon oil to the Dutch oven. Add the onion, jalapenos, and garlic and reduce the heat to medium. Cook, stirring them occasionally, until the onion is softened, about 3 minutes. Stir in the tomatoes and their juices with the oregano and bring them to a boil. Return the brisket to the Dutch oven and add enough hot water to come about three-quarters up the side of the meat. 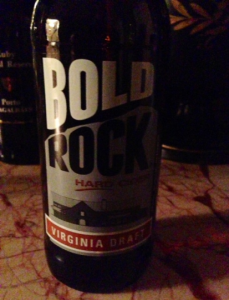 Bring it to a boil over high heat. Cover the Dutch oven and transfer it to the oven. Bake until the brisket is fork-tender, about 2. hours. Transfer the brisket to a carving board, tent it with aluminum foil, and let it stand for 10 minutes. Set the cooking liquid aside.